We are happy to announce our resume formatting software has been approved and is available in the Office App Store. Here is a link to the app. 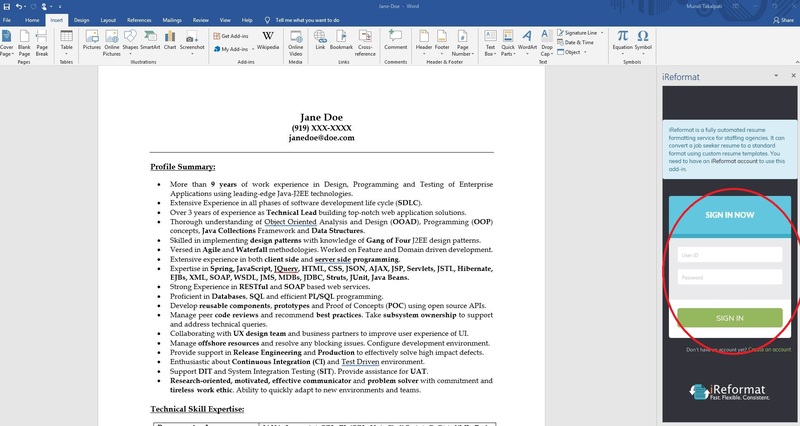 In this post, will detail how to add the app to Microsoft Word and make use of all of the features available in our resume formatting software. 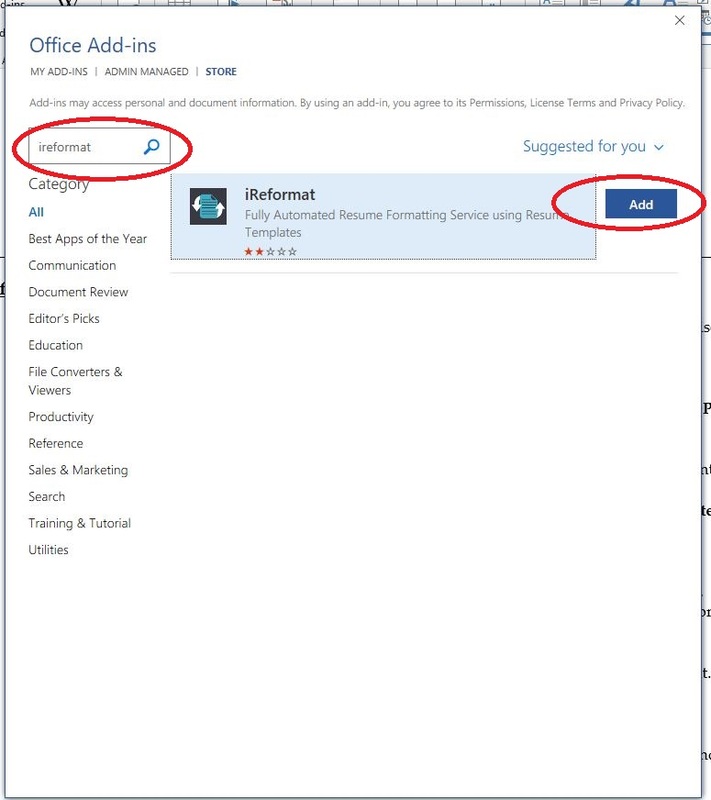 NOTE: The app in the Office App Store works for Office versions 2013 and greater including Office 365. Once the app is added, next time if you want to use it, it is available from the “My Apps” ribbon button. The “My Apps” button is right below the “Get Add-ins” button. 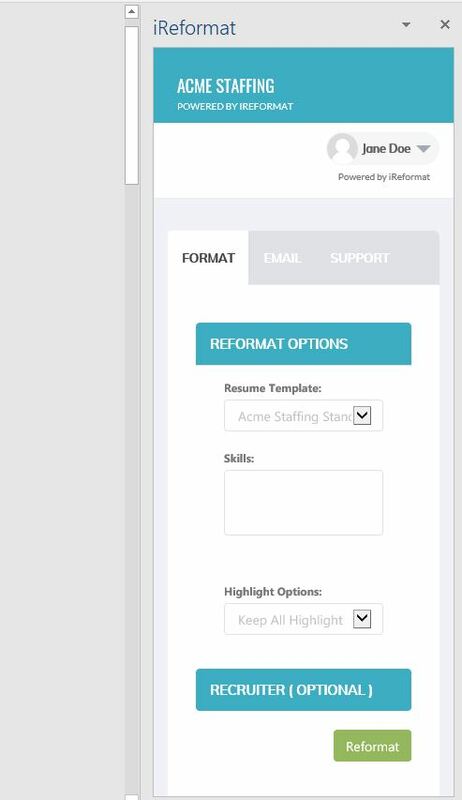 If you do not have an iReformat account on www.recruiteze.com, you can click on create account, which will lead to the page on recruiteze.com for signing up. Once you signup for the iReformat service. You can login using the email address and password in the login screen above. NOTE: Please contact support at recruiteze dot com, if you need a custom resume template. One custom resume template is created free for each account, when you signup for the service. Once you login, you will see the Reformat screen like below. If you have used our web-based resume formatting software, you will see that it looks exactly like the screen in the web application. Here in the “Reformat Options” section, you have the ability to pick a resume template. Once you have the resume open, and logged in to the ireformat office app. The only selection you have to do is pick a resume template. If you always use just one template, you just have to click on the “Reformat” button. The other optional features are the ability to highlight(bold) skills/keywords in the formatted resume. Once you pick a resume template, you can add the skills you like to be highlighted(shown in bold) in the formatted resume. You need to enter skills seperated by commas. a. Remove all Highlight – This option removes all the bold formatting in the resume. b. Keep all Highlight – This option retains all the bold formatting and does not make any changes. c. Highlight Skills/Keywords – This option highlights the skills and keywords entered in the skills field. d. Highlight sentences with Skills/Keywords – This option highlights the entire sentence which has the skill/keyword. e. Remove all Highlight and Highlight Specified Skills/Keywords – This option removes all the bold formatting in the resume, and highlights only the specified skills in the skills field. Recruiter is another optional section, here the logged in Recruiter is selected by default. 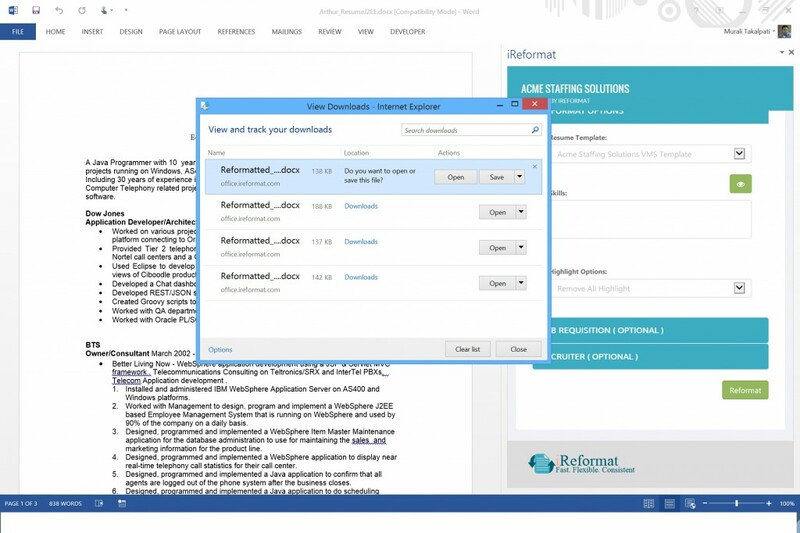 Once the required options are selected, clicking on “Reformat”, will format the resume and is available for download. The Open/Save As dialog pops up, once the formatting is complete. The next picture shows the dialog that pops up after formatting the resume. After saving the formatted resume, clicking on open will open the formatted resume. 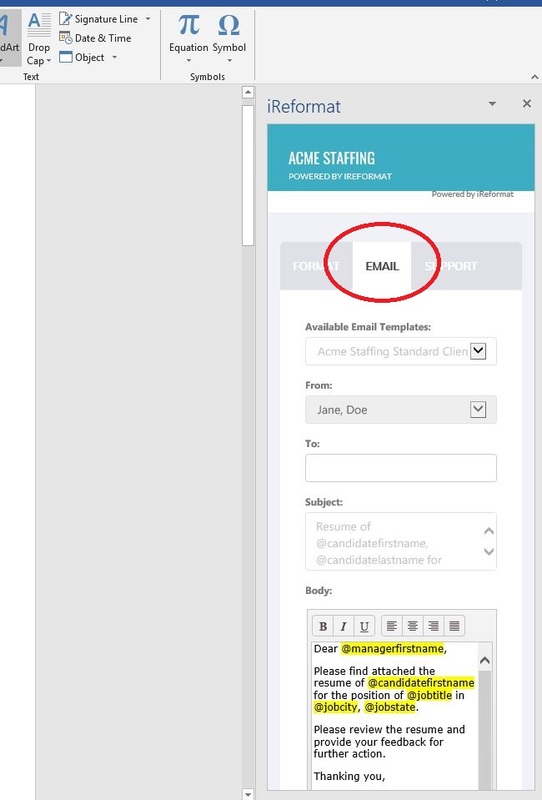 Once you open the formatted resume, you can edit it if you need to or email it using pre-defined email templates. The next picture shows the email tab of the iReformat Office Application, the world’s best resume formatting software. From the Email Tab, you can pick one of the email templates, and send the email. The next tab is the Support tab, please feel free to use this tab to contact us for Support or providing Feedback. We are always looking to improve our product, design and service. We welcome all suggestions, so please feel free to provide your feedback or let us know if you run into issues. Hope this information was useful to you and looking forward to keep providing value to our users. We’re always looking for feedback so don’t hesitate to let us know how we can make our resume formatting software better. If you like what you see, please share it with your friends, so that more people can become aware of our solution. If you have any questions/suggestions/feedback, please send an email to support at recruiteze dot com, we will get back to you.